It seems like it’s getting colder earlier this year. While we’ll probably get some warmer weather before ice covers the lakes and ponds, the cold weather is a good reminder of what’s coming. Temperatures in the 40’s and 50’s can encourage the fish to go on the bite, and the opportunity to take a real trophy is very good in the next few weeks in open water if you’re on trophy water. And we know what comes after that: Ice-fishing. The upcoming weeks and months can provide outstanding fishing opportunities in open water and through the ice, but to enjoy and take advantage of those opportunities, we need to dress appropriately. It’s no fun being out there if you’re cold. Following are some ideas for keeping warm when it’s chilly on the water or cold on the ice. The first thing to consider is safety. It’s always a good idea to wear a life-jacket when you’re in the boat. Reality is, many, many anglers wear their life-jacket when the boat is running above idle speed, then take it off when they get to their fishing spot. Most of the time that’s ok, but in the cold water period, you really need to consider leaving it on even when you’re anchored or at trolling speed. Every now and then something happens and we unexpectedly end up in the water. If you can swim, and it’s a warm weather period, that’s no big deal. At this time of year though, when you’ve got a lot of heavy clothing on, a fall into the water can be tragic. A life-jacket will reduce the chance of tragedy. I’ve been wearing an inflatable life-jacket for several years now. It’s so comfortable that I don’t even realize I’m wearing it. Now about dressing: Layering your clothing is the way to go. Start with a base-layer of Cabela’s MTP: It’s good stuff, it’s comfortable, it’s effective, and it’s reasonably priced. Wear a pair of jeans on the bottom, a hooded sweatshirt on top. Next, a vest, and last, a windbreaker parka for your outside layer of clothing. Cabela’s Guidewear is a great outer. It’s tough stuff. I’ve worn the same Guidewear for years and it’s still doing the job. It’s your choice whether you go with a lined or unlined parka. If you go with the lined, you’ll almost always be warm. The unlined version does an outstanding job of breaking spray and wind. If it’s really cold and windy, you’ll want to consider a pair of Guidewear Bibs. I wouldn’t want to be without them. I’ve tried a couple of different types of coats for the outer layer and greatly prefer parka length outers. They’re longer and just more comfortable to me. Some prefer the jacket length: That’s why they make both styles. I would suggest trying them on in a store to see what you prefer. The beauty of layering your clothing is, you can take off a layer as the day warms up. If you’re going to be fishing in the cold weather period, layering your clothing is the way to go. Last thing: Remember to take a net. You don’t want to be lipping or lifting fish from these cold waters. Beckman is back in the net business and is again providing an outstanding net. I always prefer to net my fish. It’s better for the fish and for your hands. 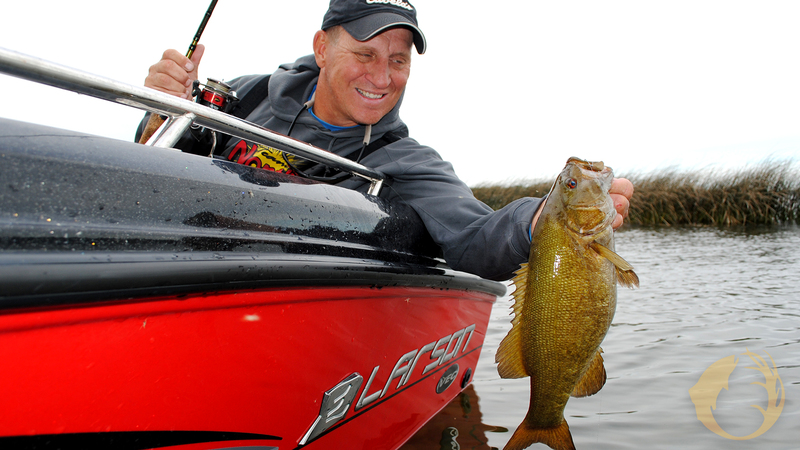 For many anglers, the fishing season is just beginning. Dress appropriately and you’ll enjoy the fishing even more. Feature Photo: Smallmouth bass go on a fall bite. Dress properly and get in on the bite.